As everyone knows, I'm a fan of Dolly Wink eyelash fix/glue and always recommend it to anyone who looking for eyelash glue (＾▽＾). You may already know that Dolly wink has released new Eyelash fix in Black. BLACK, yeah finally Dolly wink release the Black version with improved formula. They said this glue is waterproof too! Well, curious? Packaging :: Compared to old version of Dolly wink eyelash fix, this one is less less cuter but somehow look more professional. The black glue can be messy to apply if I'm in a rush. lol. And that's what I hate about black glue. There just slightly difference between those two, if you use the white one, it would turn into transparent / no color. So If you want to achieve natural look you should use the white one. The black glue will make the line look more bolder. I got the Eyelash fix about 16 USD, you can find this product at Artiestyle, they sell many Japanese product there. And you can get 10% discount too if you purchase more than $20 with my code "cominica". What is your favorite false lashes glue?? Do you think I need a website for Comicou? Btw, Thanks for all birthday wishes ladies~~ ｡◕‿◕｡ ! Can't reply it one by one, but really thank you so much~(。┰ω┰。)!! Have a great weekend! I use the clear dolly wink glue too xD;; I used to use Duo but the tube was just tricky..sometimes it makes a big mess if you accidentally squeeze too much :( I prefer having a small wand to spread the glue with! I think taht I'll purchase de classic white! This fixer is really good, I wanna prove the "Koji" fixer.. seems that is really good, but is more slow to dry ToT Do you tested it too?_? me too! 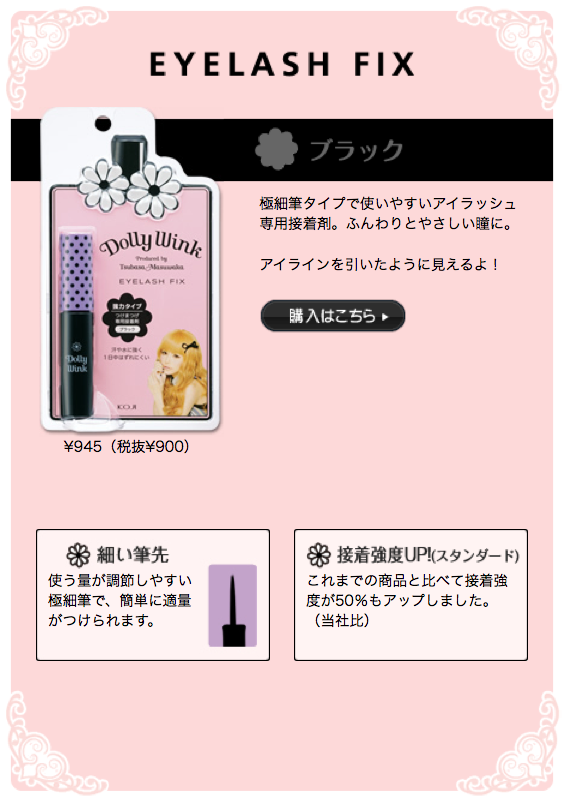 i love dolly wink eyelash fix, esp the white one. Ah the glue seems pretty nice! I have to say though that white glue is more forgiving. ^^ I think I should pick up some dollywink glue. Yes! Make a website for Comicou!! I would definitely follow.